Q: China and El Salvador established diplomatic relations today. What is your comment? A: This morning, State Councilor and Foreign Minister Wang Yi and Foreign Minister of El Salvador Carlos Castaneda, on behalf of the two governments, inked the Joint Communiqué on the Establishment of Diplomatic Relations between the People's Republic of China and the Republic of El Salvador in Beijing. The two governments decided to recognize each other and establish the diplomatic relations at ambassadorial level as of the day the Joint Communiqué was signed. There is only one China in the world. The government of the People's Republic of China is the sole legal government representing the whole China. Taiwan is an inalienable part of China's territory. This is a historical fact and a well-recognized norm governing international relations. El Salvador is an important country in Central America. The government of El Salvador recognizes and promises to abide by the one-China principle. It has severed the so-called diplomatic ties with Taiwan and established diplomatic relations with the People's Republic of China. This is a right choice made in accordance with the trend of the times and the will of the people. The Chinese side highly appreciates that. On the basis of the Five Principles of Peaceful Coexistence and the one-China principle, China is willing to enhance friendly cooperation with El Salvador in various areas so as to deliver benefits to the two countries and two peoples. Q: According to the Wall Street Journal, the trade representatives from China and the US are discussing a road map so as to end the trade dispute deadlock before the leaders of the two countries meet during the November multilateral summit. Can you confirm this report? A: Usually, we do not comment on media reports. I have said many times that we certainly hope that a mutually beneficial and acceptable solution could be reached through friendly consultations on the basis of reciprocity, equality and good faith. This is the right thing to do, not only for the consumers and business communities of the two sides, but also for the international community. You mentioned the report saying that China and the US are preparing for a summit meeting later this year. I do not know where this report sourced this information. In principle, high-level exchanges, especially ones between heads of state, always have an important role to play in leading the development of bilateral relations. Q: US President Donald Trump said yesterday that he does not expect much progress from the trade talks which are due to happen in Washington this week. Do you expect there will be progress? A: In response to the repeated invitations from the US side, Vice Minister of Commerce Wang Shouwen has led a delegation to the US for trade talks with the US delegation led by David Malpass, the US Treasury Department's Under Secretary for International Affairs. The Commerce Ministry has released relevant information. For us, since we are going to talk to each other, we certainly hope that talks could lead to good outcomes. But one thing you should know is that we prefer no unnecessary prejudgments and predictions. Just let the two sides sit down calmly, talk to each other while bearing in mind reciprocity, equality and good faith, and try to deliver some good outcomes. Q: Malaysian Prime Minister Mahathir has wrapped up his visit to China. Could you talk in details about this visit, such as the outcomes and agreements reached during the visit? A: At the invitation of Premier Li Keqiang of the State Council, Malaysian Prime Minister Mahathir paid an official visit to China from August 17 to 21. During the visit, Prime Minister Mahathir met with President Xi Jinping and held bilateral talks with Premier Li Keqiang. He also met with Li Zhanshu, Chairman of the Standing Committee of the National People's Congress of China. 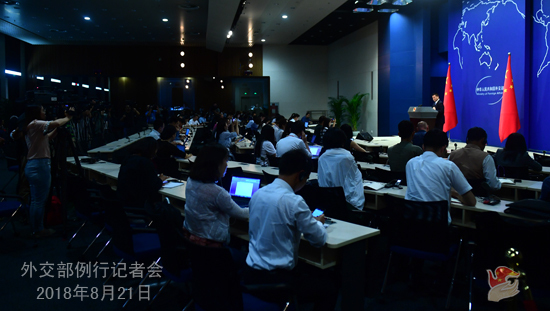 Besides these official meetings and talks, Prime Minister Mahathir also visited Hangzhou City of Zhejiang Province where he met with some Chinese entrepreneurs. This trip was his first official visit outside the ASEAN member states since taking office as the Malaysian Prime Minister this year and also his eighth visit to China in the capacity as the Malaysian Prime Minister. Both sides are quite satisfied with the outcomes of this visit which can be summed up in the following four aspects. First, both sides agreed to maintain long-term friendship. China and Malaysia enjoy profound historical ties. The two countries are comprehensive strategic partners as well as partners of practical cooperation. Standing at new historical junctures of our respective national development, China and Malaysia will enhance political mutual trust and practical cooperation and work for the sustained and steady development of our comprehensive strategic partnership. Leaders of both sides affirmed that however the situation may evolve, China and Malaysia will always hold friendly policies toward each other. Second, both sides held in-depth discussions on the Belt and Road Initiative. Malaysia is an important country along the ancient Maritime Silk Road. It is also among the first to echo China' Belt and Road Initiative. The two countries will advance bilateral practical cooperation in the new era following the main thread of jointly promoting the Belt and Road Initiative. Prime Minister Mahathir said that China's Belt and Road Initiative has brought tangible benefits to countries along the route. Malaysia actively supports this initiative and stands ready to enhance all-around connectivity and cooperation with China. Both sides will speed up the implementation of the MOU on the Belt and Road Initiative and discuss the formulation of relevant outline of cooperation plans. Third, both sides agreed to forge new landscapes for China-Malaysia practical cooperation at the new starting point. Both sides are pleased with the current bilateral trade and economic relations and will treat each other as a partner for trade and investment, industrial cooperation and innovative growth to realize win-win results. The two countries will continue to strengthen and expand cooperation in the fields of infrastructure, industrial capacity, e-commerce and innovation, expand trade volumes, and encourage two-way investment. During the visit, China and Malaysia signed several bilateral cooperation documents including agricultural and financial ones. Both sides agreed to jointly formulate the Five-year Program for Economic and Trade Cooperation for the period of 2018-2022. Fourth, both sides sent out positive signals to safeguard free trade and multilateralism. The two countries will jointly champion multilateralism, oppose trade protectionism and unilateralism, uphold the purposes and principles of the UN Charter and the WTO-centered multilateral trading regime, and promote the sound development of economic globalization. China and Malaysia will strengthen cooperation at the UN and other multilateral fora, enhance South-South cooperation, and safeguard the interests of developing countries. I would like to point out that China stands ready to build on Prime Minister Mahathir's successful visit and work with Malaysia on the basis of mutual respect, equality and mutual benefit to move forward bilateral ties along the track of good neighborliness and friendship, ensure the long-term sound and steady development of China-Malaysia comprehensive strategic partnership, and make greater contributions to regional peace, stability, development and prosperity. Q: Before leaving Beijing, Prime Minister Mahathir held a press conference where he said that due to debt problems, Malaysia has decided to cancel the East Coast Rail Link plan and two gas pipeline projects for now. What is your response? A: China pursues trade and investment cooperation with other countries under the principle of mutual benefit and win-win outcomes. China-Malaysia cooperation in these fields has been developing with a positive momentum. Prime Minister Mahathir has also been emphasizing throughout his stay in China that China's development is an opportunity for Malaysia, China is Malaysia's largest trading partner, and China-Malaysia economic and trade cooperation has brought tangible benefits to the two peoples. Of course, cooperation between any two countries may encounter some problems, and different views may emerge at different times. These problems should be properly resolved through friendly consultations without losing sight of the friendship enjoyed by the two countries and the long-term development of bilateral ties, which, I can assure you, is also an important consensus reached during Prime Minister Mahathir's visit to China. Q: First, Taiwan believes that "money diplomacy" is at play behind the establishment of diplomatic relations between China and El Salvador. What is the response from the Foreign Ministry Spokesperson? Second, earlier this year, State Councilor and Foreign Minister Wang Yi expressed the hope that no country in Africa will be absent from the family photo of the FOCAC Beijing Summit. So, will Swaziland attend this summit? A: Regarding the first question, I believe that you know the details of the joint press conference held by State Councilor and Foreign Minister Wang Yi and Foreign Minister Castaneda this morning. 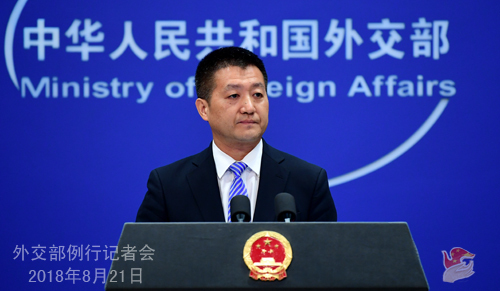 It is for the competent department of the central government to respond to the remarks made by those in Taiwan, not the Ministry of Foreign Affairs. That said, I still want to emphasize that the establishment of diplomatic relations between China and El Salvador is a political decision. It is by no means a so-called "bargaining chip" as imagined by some people in Taiwan. The Salvadoran government made the political decision to establish diplomatic relations with China without any economic preconditions because it identifies with the one-China principle. China highly appreciates this position of the Salvadoran side. I also want to remind those people in Taiwan that to establish and develop normal and friendly relations with the People's Republic of China is the trend of the times and the will of the people. They should learn to recognize this overwhelming trend and stop trying to explain everything away in terms of money. You mentioned that there is still one African country that has not given up its so-called "diplomatic ties" with Taiwan. 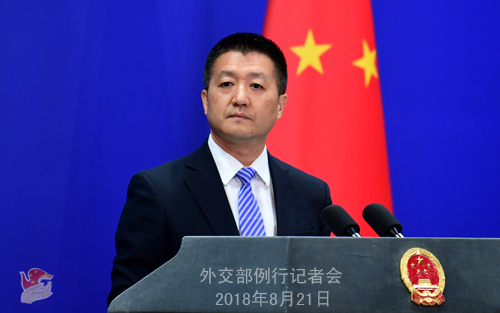 We have repeatedly stated that the Chinese government is always ready to forge friendly and cooperative ties with all countries in the world on the basis of the Five Principles of Peaceful Coexistence and the one-China principle. We believe that such a relationship is in the interest of each other and we hope that the relevant country could clearly discern the trend of the times.